NextStepU is passionate about helping college-bound students, parents, and counselors with objective college planning. We’ve created a “one-stop shop” for teens and their parents which includes tons of content, resources, a college match tool, a scholarship search tool and a customized dashboard to guide them to their “next step". We have articles that are ranked #1 by google. We also offer digital magazine resources for college planning and STEM. A trusted brand for 21 years among high school counselors, students, and college admissions, we continue to add innovative tools, content and technologies as a leader in the education media space. What started as a college planning magazine is now a thriving digital business. The college planning path is your personalized guide to help you along your education journey. Figuring what you want to do after high school is no easy task but we're here to guide you through the process of getting from where you are to where you want to be. Give us your starting point and destination and we'll show you everything in between. We'll cater the articles and tools that we show you to exactly what you need based on where you are in your path to college. 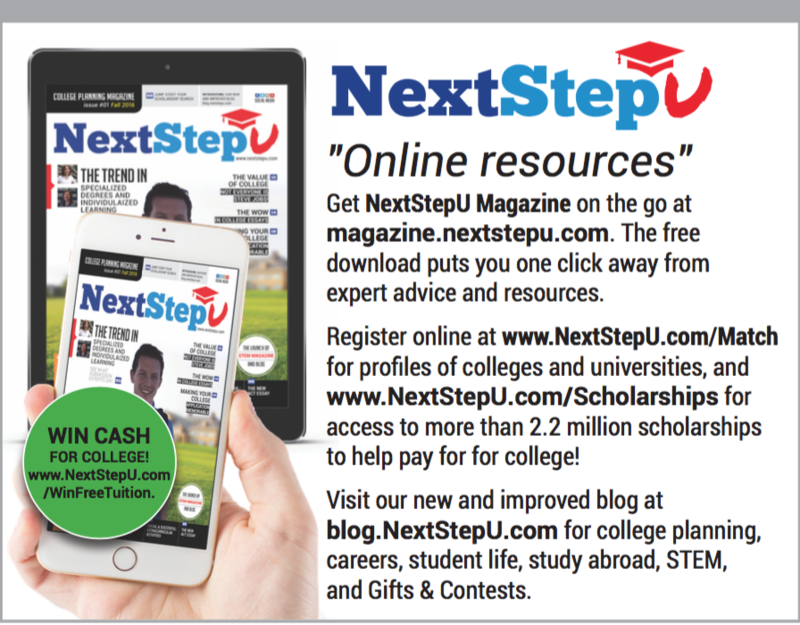 You can register with NextStepU.com to be entered into our $2,500 scholarship contest offered twice a year. We also currently offer $1500 STEM scholarship 3 times a year. Find schools that fit your interests. Sort colleges by the regions that you'e interested in, whether it be close to home or abroad. If you have a particular major in mind that you want to pursue, sort your college search by major option. We’ll only show you the colleges that offer the programs you’re interested in. If you find a college that you want to know more about, you can select to get more information from them. We’ll put you right in touch with the colleges you’re looking at to give you all the information that you need. We offer digital college planning and STEM magazines with articles, tools, and interviews with college admissions, counselors and industry thought leaders.